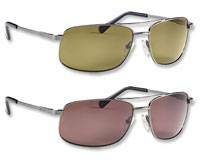 These polarised sunglasses protect your eyes from harmful glare. Block the glare and concentrate on battling the fish. Polarized polycarbonate lenses are lightweight and shatter resistant. In matte tortoiseshell frame with amber lens. One size fits most. 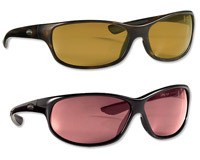 Eliminate glare and see more fish with these Orvis polarised fishing sunglasses. Lightweight and shatter-resistant sunglasses let you forget the glare and focus on the fishing. olarized lenses offer 100% protection from harmful UV rays. In tortoise frame with amber lens. One size fits most. These fishing sunglasses are lightweight, polarised, and shatter-resistant. The glare doesn't stand a chance with these lightweight polarised sunglasses. Shatter-resistant lenses offer 100% protection from damaging UV rays. In brown stripe frame with amber lens. One size fits most. You know it's going to be a good day when you can see through the glare and also be able to thread the tippet through the eye of your fly. Polarized magnifier polycarbonate lenses block glare. Lightweight, shatter resistant, and ready to adventure. Comfortable wrap-style frame holds lightweight premium polarized acetate lenses. Lens colors in grey, amber. Case included. Polarised polycarbonate lenses, rock-solid frames, and a price that's hard to beat. More than just a new style, they're an innovation in polarisation. Pre-tinted polarised film is sandwiched between two layers of the polycarbonate lens material, which are then bonded together - resulting in a lens with excellent optical quality and no distortion. Grilamid® TR 90 nylon frames are lightweight, super strong, and hold their shape in extreme temperatures. Lenses offer UV protection and scratch resistance. Thermal-formed polycarbonate lenses. Lens colour in brown, grey. Italy.